A couple years back, my pal Dan (most recently of rattlesnake culinary ambitions infamy) invited us over for dinner. He was making Crab Louie. Crab Louie, I thought, now there’s a classic dish that doesn’t get much ink in the foodie lexicon. So I decided I would feature Dan’s dinner on my blog. On the appointed night, we arrived wine in hand. “Tell me what you’re doing there, Dan,” I said, iPhone video camera in hand. And Dan, who is a natural on camera, walked me through the process of making this delicious salad while I asked insightful questions and captured it all on the phone. Unfortunately, it was Dan’s phone I was using. I got home and sometime in the next couple days, began composing my Crab Louie post. But repeated efforts to get the video off Dan’s phone and into my hands proved fruitless. He tried to send it to me, but the file was too big. Requests from that point went largely unanswered, and then the next time I tried to retrieve it in person, the video had been lost. So this time we got the dinner invitation — “I think I’m gonna make Crab Louie!” — I made sure to bring my own phone. Like many regional specialties (Buffalo wings spring to mind), the origins of Crab Louie are vague and claims to the invention many. Most histories point toward San Francisco and the early years of the 20th century, while there are also references to a similar salad in Portland, Oregon, and to an hotelier named Louis in Spokane, Washington, around the same time. The truth, whatever it may be, is irrelevant — we have the salad, and that’s what matters. Combining bibb or oak leaf lettuce, tomatoes, assorted vegetables, sometimes hard-boiled egg and a generous serving of crab all through together with tangy zip of a mayonnaise-and-ketchup based dressing, it’s the perfect California summer salad. Much like its Southern California cousin the Cobb, the Crab Louie is a salad sometimes served in its individual components, sometimes tossed with the crab piled on top. 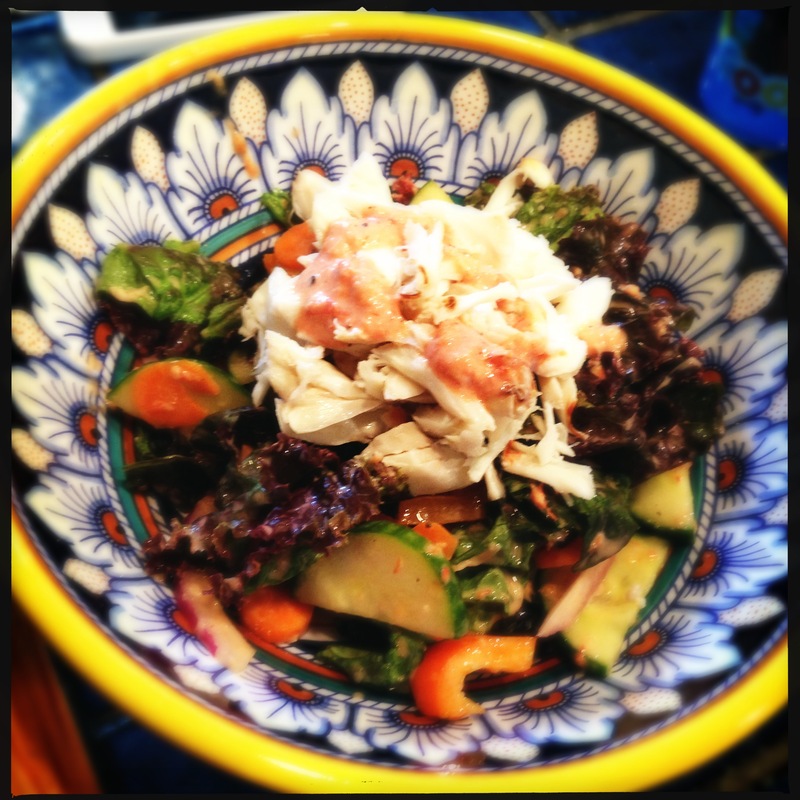 Being a West Coast salad, the most common crab to use is the incomparable Dungeness. After a lively discussion of the best kind of crab — Dan singing the praises of his jarred crab meat from Southeast Asia (“They put it fresh right into the jar!”), me betting on Dungeness versus any contenders, and East Coast transplant Jon meekly defending the merits of the Atlantic’s tiny, practically meatless blue crabs, we dug in. A loaf of tangy, butter-slathered sourdough bread evoking San Francisco and one of our lush family Wine Guerrilla zinfandels completing the California taste triumvirate, we sat back and watched the golden sun settle over the chaparral mountains behind the house. And realized that sometimes heaven is only so far as some good friends, a delicious wine and a perfect salad away. Here’s the recipe — in Dan’s own words — in case you wanna do the same. Enjoy! *Should look a lot like thousand island dressing on steroids when done right. Stir all ingredients vigorously together. Best to make it a couple of hours early to let all of the flavors mingle while in the fridge. Salad uses Bibb lettuce traditionally but any of the nice soft lettuce works like red oak leaf. Cucumber, colored peppers, carrots, less red onion, and a hard boiled egg is always a nice addition as well. Some hot sourdough baguette is a must as well to accompany. That does sound like a lil’ bit o’heaven. Room for one more at that table? There’s always room at the table, my friend. You could try it with sandcrabs, but they would probably burrow into your cheeks before you could chew them. Well you finally got it on blog my sweet foody brother from another mother. Makes me want some just watching the video. Me thinks Louise is on our horizon, let’s go Dungeness next time for comparison! Let’s have Crab Night! You do Louie, I’ll do crab dip and maybe crab cakes… Mmmmm, crab. I first had Crab Louis in Seattle and associated it with there, but who knows? It’s good. I like Dungeness, too. Where do you find the Asian jarred crab? I’m guessing they get it at Whole Foods, since those guys like to spend more money on things than they need to. I was just at Trader Joe’s an hour ago, and two of the stockers were having a lively discussion on where the new jarred crab should go. So I guess you can get it there now too, probably for a third of what it would cost you at WF.